The Copenhagen Climate Change Conference 2009 is hosted in Denmark in the city of Copenhagen from the 7th to the 18th of December, 2009. This is the 15th United Nations Climate Change Conference, and is also referred to as COP15. The two-week summit involves politicians and officials from 192 countries. More than 15,000 people are attending — not counting the protesters and activists expected to make their presence felt outside the Bella convention centre. The goal of the conference is to come up with a global agreement to cut greenhouse gas emissions in line with what scientists say is necessary to avoid the worst climate change projections: melting ice sheets, rising sea levels, expanding desertification, widespread drought, famine and species extinction. The UN climate talks in Copenhagen descended into acrimony after the leaking of a draft "Copenhagen Agreement" that would require developing countries to take on targets as the world cut emissions in half by 2050. Drafted by the Danish Government after talks with the so-called "circle of commitment", including Australian Prime Minister Kevin Rudd, the document said global emissions should peak by the end of the next decade but did not include any emissions targets for 2020 or specific proposals for the creation of a green fund to help the most vulnerable. Control of climate change finance would be passed to the World Bank. Poor countries would be further divided by creating a new category of developing countries called "the most vulnerable"
The UN's role in handling climate finance would be weakened. Poor countries would not be allowed to emit more than 1.44 tonnes of carbon per person by 2050, while rich countries would be allowed to emit 2.67 tonnes. Tuvalu has lodged an initiative from the 43 member Alliance of Small Island States (AOSIS) calling for a legally binding deal in Copenhagen and halting the "business as usual" negotiations. Small island states and poor African nations vulnerable to climate impacts laid out demands for a legally-binding deal tougher than the Kyoto Protocol. This was opposed by richer developing states such as China and India, which fear tougher action would curb their growth. Tuvalu demanded - and got - a suspension of negotiations until the issue could be resolved. The split within the developing country bloc is highly unusual, as it tends to speak with a united voice. After talks resumed in the afternoon, the Tuvalu delegation walked out when it appeared that the issue might be sidelined. Developing nations staged a two-hour walkout, accusing the developed world, led by the European Union, Australia and Japan, of pushing to "kill the Kyoto Protocol". The walkout was organised by the G77 group, which represents 130 small, mostly African nations. G77 chief Lumumba Di-Aping has accused the Danish president of the Copenhagen process, Connie Hedegaard, of siding with the United States and the rest of the developed world in trying to kill off Kyoto. The only country to dispute that climate change and global warming is occurring was Saudi Arabia, citing the "Climategate" emails from East Anglia. All other countries have stated that action is needed to address climate change. Developing nations such as the G77 want the emission reduction targets imposed on developed nations by the Kyoto Protocol to be maintained - stating that these are the only legally binding commitments in place so far. Developed nations such as Australia, USA and the EU argue that high emitting developing nations such as China and India must now also commit to emission reduction targets. The United States is continuing to refuse to sign the Kyoto Protocol. China is reluctant to accept mandated emission reduction targets and is opposed to independent monitoring and/or auditing of their emissions. The Long term Co-operative Action track (known as LCA) is attempting to formulate a new treaty. The president has prioritised the LCA track, which has been interpreted as favouring the powerful developed countries. This has created some ill feeling directed at the Danish government and is seriously undermining the likelihood of a "political" outcome, let alone a legally binding one. Australia has attempted to avoid accounting for emissions from land clearing and bushfire events under the Land Use Land Use Change and Forestry (LULUCF)section. A French negotiator criticised Australia for cheating by seeking this exemption, stating that Australia should commit to full carbon accounting for the third commitment period. For the second commitment period being decided here, Australia must commit to accounting for all land use activities using spatially explicit data. Negotiations on Reduced Emissions from Deforestation and Degradation (REDD) have not established protection of forests as a key priority, despite deforestation contributing 20% of emissions globally. There is no real leader amongst negotiating countries, and environment groups on the outside are struggling to keep any language to do with forest conservation or protection in the legally binding part of the negotiating text. Equally important is to ensure that there are safeguards concerning the livelihoods of indigenous people who rely on forests and who have protected forests for millenia. Another sticking point is forest governance. Developing countries must improve governance to ensure that finance for forest conservation actually goes to the communities living in or near the forests and is not diverted through corruption. Countries like Papua New Guinea and the Democratic Republic of the Congo have succeeded in removing this language from the legally binding part of the text because developed countries have not put enough money on the table to compensate these countries for loss of logging revenue and for ongoing stewardship of the forests. Developed countries must make funding commitments clear for REDD so as developing countries sign on. Developing countries must be assured that the forest is worth more standing than logged. $4 billion will not do it. Australia has not yet made any finance commitment under REDD. The chief negotiator for China and the small African nations at Copenhagen has accused Prime Minister Kevin Rudd of lying to the Australian people about his position on climate change. Lumumba Di-Aping, who represents China and the G77 group of small countries, was speaking as the talks remained deadlocked and world leaders, including Mr Rudd, began arriving in the Danish capital. Mr Di-Aping said he had high expectations of Mr Rudd, but claimed that throughout the negotiations the Australian Government has not matched its actions with its rhetoric. 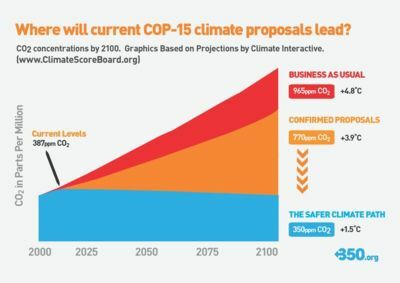 The following draft agreement could deliver a good chance of a safe climate future. Note that this is a suggested framework, not the actual framework under consideration at the conference. Global per capita emission to be limited to 2 tonnes per person per year, and that all nations take action to achieve this by 2030. Countries under this level are permitted to rise to it. Countries over this level are to reduce to it. The conference ended with the Copenhagen Accord political agreement led by the United States and China. The document was not formally endorsed by the conference. 29 of the 193 countries present at the conference have been reported as supportive, but no information is currently available on this. Many developing nations and many environment groups have criticised the accord for not including any binding emission reduction targets. Sudan, Nicaragua, Cuba, Venezuela, and Bolivia denounced the plan after heads of state and government had flown home. Sources close to the talks told Reuters the Danish hosts and U.N. lawyers had not obtained formal backing from the conference for a smaller group of leaders and ministers to agree on a final text, leading to chaos when this was finally presented to a plenary meeting of all 193 countries. U.N. talks are meant to be concluded by unanimity. Under a compromise to avoid collapse, the deal listed the countries that were in favor of the deal and those against. Smart bike wheel launched at the Conference. ↑ Australia 'trying to kill Kyoto', Emma Alberici, ABC, 15 December 2009. This page was last modified 02:27, 7 December 2015. This page has been accessed 196,682 times.